Too Faced is one of my favorite cosmetics brands. My favorite products are their eyeshadows and bronzers. Their eyeshadows are insanely pigmented and many of the colors are multi faceted and surprsing. I have the Poison Orchid eyeshadow too and depending on the way you look at the shade and the way it hits the light, it can look black, purple, or blue. Pure amazing. Here is a look I did with the Too Faced Natural Flirt Collection. This gave me the opportunity to try some of their products I hadn't used before like the shadow insurance I've heard so much about, their mascara and lip plumping gloss. This is a great deal because it comes with a full sized eyeshadow in Magic Mushroom, full sized lip gloss in This is Pretty, and full sized Bronzer in Pink Leopard along with other goodies including a mini Shadow Insurance eye primer in Candlelight (thicker cream consistency, light golden color), Lashgasm mascara, mini powder brush, and an adorable bag. This retails for for $45.00 but has a total value of $112.50. What a great deal. Over my foundation I applied the bronzer all over my face with a fluffy powder brush. I then used a smaller brush to pick up just the pink color from the bronzer and dusted the pink color onto my cheek bones. 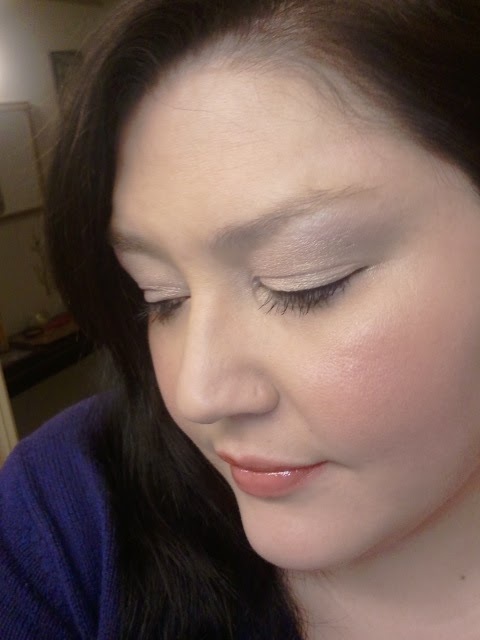 Then using a smaller brush (or just pinching the bristles in the mini powder brush provided), I picked up some of the golden color and dusted this ontop of my cheek bone and above the brow (the power V area) for a nice highlight. I applied the shadow insurance in candelight all over my lid and topped it with the Magic Mushroom shadow. I also applied this shade in the inner V area of my eye. I brought this color all the way up to the browbone. This is a very pretty light pink shade. But this also has some golden tones to it. I love this color! This is a perfect everyday color that has a little something extra to it! How gorgeous! When this color hits the light you can see the golden tone to it. I applied some liquid liner on the upper lash line and some black liner on the lower lash line. I then used the Too Faced Lashgasm mascara. This is a small brush with small plastic bristles. This gave some really great length and volume to my lashes. The bristles ensured minimal clumping. I then applied the Glamour Gloss in This is Pretty. This is a very light pink color. I had some remnants of some lipstick on from the day, so I think this appears a tad darker than it may worn alone. This is a great gloss to wear alone or to top off any lipstick with. This has a nice tingly plumping action. Here is a video I did from a Sephora haul which included this kit if you want more information. If you haven't tried Too Faced yet, I would highly suggest picking up this kit. This is an amazing deal for the amount of product you get, including 3 full sized items which alone would retail more than the cost of this entire kit. The bronzer is multi-purposed. You can apply this lightly all over the face or pick up the indifividual colors to use as a highlight or blush. I love this Too Faced Natural Look! You can create a very natrual look with this yet while still encompassing some of Too Faced's signature style! Beautiful! 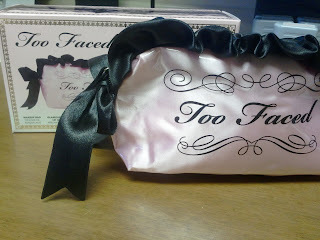 I was just looking at some of Too Faced's products the other day and was really liking what I saw! If only I had the money because they have what looks like some great sets.